The SPARK program is designed to spark creativity and innovation in elementary and middle school students. Students will explore exciting topics of their choosing in the science, technology, engineering and math disciplines. The foundation set during these programs will follow students for a lifetime. Dates: See below for specific programs. The following programs will be offered for summer 2019. Using the LEGO MINDSTORMS platform participants work as part of a small team to design, build, test, and program a robot that will face off against others in a friendly competition on the final day. Imaginative thinking and teamwork will prevail as they learn how to make robots move, line track, navigate obstacles, and pick up and transport objects. 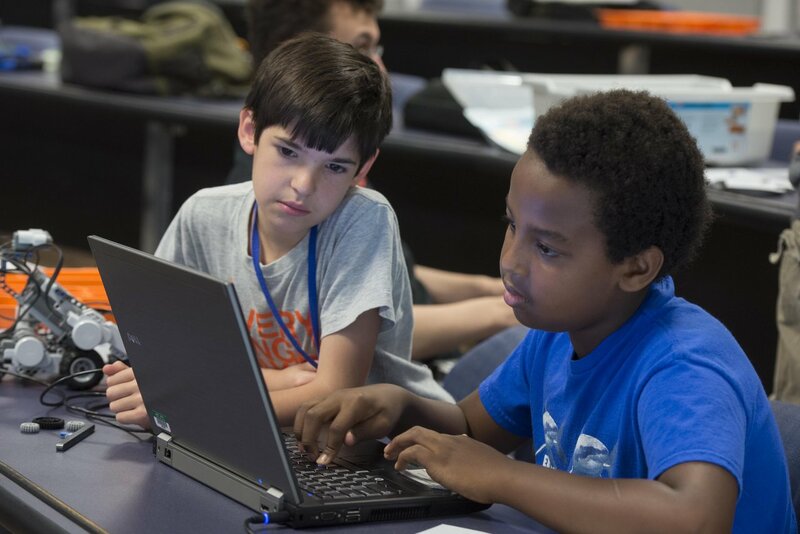 Using the LEGO MINDSTORMS platform, participants work as part of a small team to design, build, test, and program a robot that will face off against others in a friendly competition on the final day. Imaginative thinking and teamwork will prevail as they learn how to make robots move, line track, navigate obstacles, and pick up and transport objects. Participants will learn about chords, chord patterns, and the way that popular musicians use chords to write music, as well as how to compose, perform and record music using interactive music software instead of traditional instruments. Friends and family are invited to attend a special performance of the digital compositions on the last day of the program. More details can be found here. Participants discover the fun side of physics and develop a new appreciation for the universe through dynamic demonstrations like debunking science fiction films and experiments with lights, lasers, and sound, and hands-on activities like tug-of-war and water rocket competitions. These fun activities will take place both indoors and outdoors, so be sure to pack sunscreen and sunglasses! Participants explore virtual reality by designing their own video games! In this exciting program, participants will learn the foundations of video game level design, programming concepts, and interactive media, while building video games. They will partake in game development projects in 2D and 3D environments, allowing ideas and creativity to run wild. No previous experience is required. Young women come together to learn how careers in science, technology, engineering, or math (STEM) are collaborative, creative, and help address a variety of social issues. Participants will rotate through multiple hands-on workshops each day, presented by female role models including WPI faculty, graduate students, and industry professionals. Participants receive a hands on experience, and work in WPI's labs.